Is your hotel located near London Palladium? Get in touch now to be listed on this page. Centrally located in London’s West End, St Giles Hotel is just a short walk away from the majority of London’s Theatres. The hotel has both the the Lazy Dog Bar and the Il Grasso Restaurant along with access to the expansive leisure centre below the hotel. Rooms are basic but clean and affordable with amenities such as tea/coffee making facilities, a private shower room, hair-dryer and a TV. Internet access is available for a surcharge. Call 020 7300 3000 for reservations and further information. 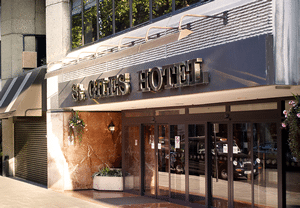 Reviewers on TripAdvisor have given St Giles Hotel 3.5 out of 5 stars. Situated just off Regent Street and very close to the London Palladium, No 5 Maddox Street is perfectly located for theatreland and London’s biggest shopping district. The hotel itself is what you would expect from a 4* hotel in central London; classy, stylish and comfortable. Guest can choose between a range of standard suites and loft or terrace suites. Facilities are of the highest standards with complimentary Atisan du Chocolat chocolates, welcome tray, gym pass and in room spa treatments and a coffee machine. Rooms also include en-suites, high speed WiFi, Flat screen sky TV’s and MP3 docking. The hotel also has its own ‘Big Bar’ and Thai cuisine restaurant. Call 020 7647 0200 for reservations and further information. Reviewers on TripAdvisor have given No 5 Maddox Street 4.5 out of 5 stars.